SEAMEO has 24 specialist institutions that undertake training and research programs in various fields of education, science, and culture. Each Regional Centre has a Governing Board composed of senior education officials from each SEAMEO Member Country. The Governing Board reviews the Centres’ operations and budget and sets their policies and programmes. Since 1968, SEAMEO BIOTROP has been contributing in identifying and recommending solutions or alternative approaches to address critical biological problems in Southeast Asia through appropriately designed research, capacity building, information exchange, and community outreach programmes in collaboration with its partner-institutions. Located in Bogor, Indonesia, SEAMEO BIOTROP envisions itself to be a leading Centre in enriching and promoting the real values of tropical biology. It is committed to provide scientific knowledge and capacity building in conserving and managing tropical biology sustainably for the well-being of communities and the environment of Southeast Asia. Under its current 10th Five-Year Development Plan (2017-2022), the Centre focuses its mandates to three programme thrusts, namely: restoration of degraded ecosystems, sustainable management of intensively used ecosystems, and conservation and sustainable use of unique ecosystems of high biodiversity. 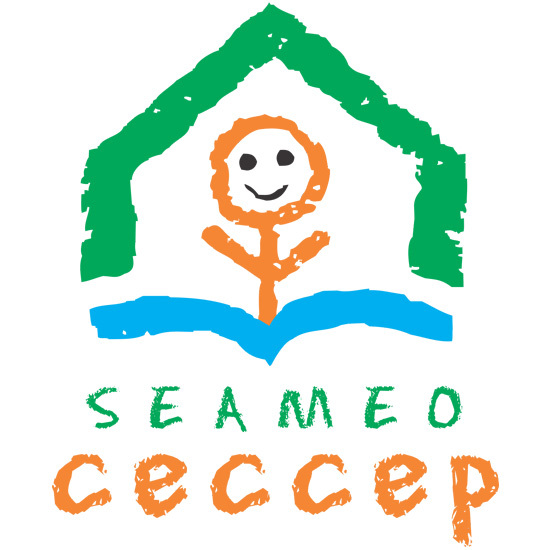 On 25 July 2017, SEAMEO CECCEP was established as the regional centre for Early Childhood Care and Education (ECCE) and Parenting. Since the establishment of CECCEP, the centre conducts research and supports advocacy and capacity building among stakeholders of ECCE and parenting. Building partnership among the SEAMEO region and enhancing the networks of policy-makers, professionals and practitioners to promote sustainable human resource development is another innovative step of the centre. The SEAMEO Regional Centre for Community Education Development is located in Vientiane Capital of the Lao PDR. The Centre aims to cater for the regional needs in promoting and provide opportunities for cooperation in the field of community education among SEAMEO Member Countries and Associate Member Countries. SEAMEO Regional Centre for Lifelong Learning (SEAMEO CELLL) was officially established following the signing ceremony of Memorandum of Agreement between SEAMEO and the Government of Vietnam on 20 March 2013 at the 47th SEAMEO Council Conference in Hanoi, Vietnam. The centre aims to cater to the regional needs in promoting lifelong learning, providing opportunities for cooperation in the field of lifelong learning among SEAMEO Member Countries, strengthening the relationship and increasing mutual understanding among educational researchers, practitioners, and policy makers of the region, in a spirit of mutual respect and partnership. Based in Quezon City, the Philippines, SEAMEO INNOTECH initiates and disseminates innovative and technology-oriented educational programmes that help SEAMEO Member Countries identify and solve common or unique educational problems and address anticipated needs. Hosted by the Ministry of Education and Culture of the Republic of Indonesia, SEAMEO QITEP in Language commits to enhance the quality of language teachers and education personnel in Southeast Asia. To achieve its commitment, the Centre conducts various professional development programmes and activities in the areas of language teaching (Arabic, German, Indonesian Language as a Foreign Language, Japanese and Mandarin). Such programmes and activities are training, seminar, workshop, symposium and research. Hosted by Indonesia Ministry of Education and Culture, SEAMEO QITEP in Mathematics offers various programmes in mathematics education for teachers and education personnel. Its vision is to be a centre of professional leadership in the area of mathematics education for teachers and education personnel within the framework of sustainability. Hosted by the Ministry of Education and Culture, Indonesia, the SEAMEO QITEP in Science was established with the vision to be the centre of excellence in professional development of teachers and education personnel in science towards sustainable development in Southeast Asia. SEAMEO QITEP in Science provides relevant and quality programmes in professional development for science teachers and education personnel through capacity building, research and development, resource sharing, and collaboration. SEAMEO RECFON was established in 1967 as SEAMEO TROPMED RCCN (Regional Centre for Community Nutrition), and transformed into RECFON (Regional Centre for Food and Nutrition) in 2011. The Centre promotes education, capacity building, research and information dissemination on food and nutrition across Southeast Asia. As a step towards sustainable human resource development, the Centre trains nutritionists, health professionals and personnel from other nutrition related disciplines in planning, executing and evaluating nutrition programmes and policies. SEAMEO RECSAM was established in 1967 to help promote and enhance science and mathematics education among the SEAMEO Member Countries. The Centre fulfils this mission by engaging in research and development activities to inform pedagogy and policy, designing and implementing high quality professional development programmes for science and mathematics educators, ensuring strong collaboration and active networking with experts, institutions and the community, serving as a clearinghouse for information by convening international conferences, seminars, and workshops as well as maintaining its journal publication, and strengthening quality assurance in the management of its resources and services rendered to its clientele. Founded in 1968, SEAMEO Regional Language Centre is located in Singapore. The centre provides SEAMEO Member Countries with expertise, training facilities and training programmes to upgrade the skills of language specialists and educators. Programmes focus on knowledge and pedagogic disciplines of language teaching and learning. Language proficiency courses are also offered by the centre. 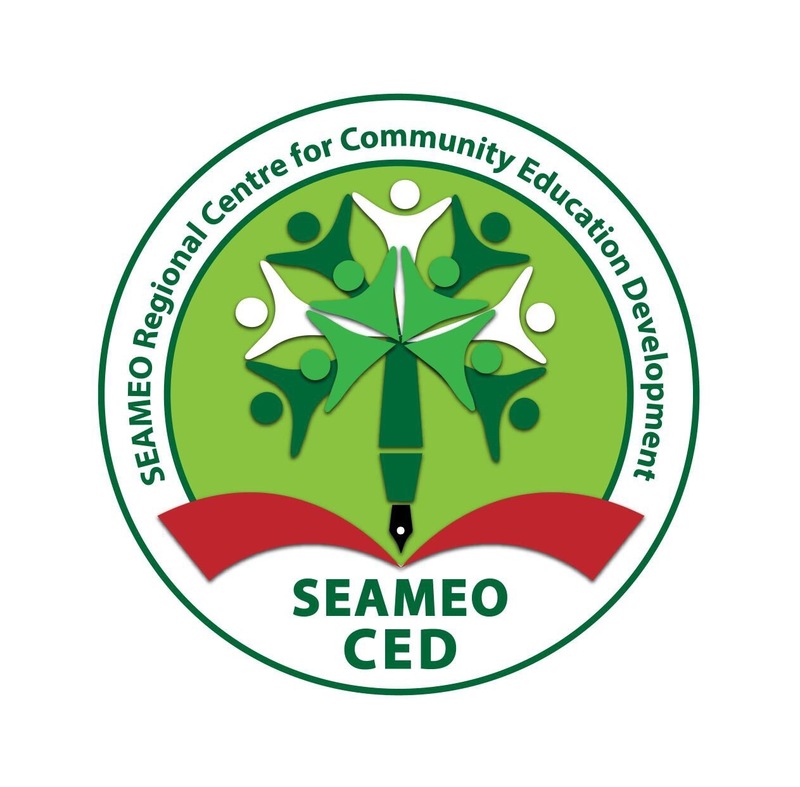 Located in Ho Chi Minh City, Vietnam, SEAMEO RETRAC assists SEAMEO Member Countries to identify and address issues of educational management by providing such services as research, training, consultancy, information dissemination, community service, networking and partnership. In cooperation of local, foreign, and international organisations. Located in Jakarta, Indonesia, the SEAMEO Regional Open Learning Centre (SEAMOLEC) assists SEAMEO Member Countries in identifying educational problems and finding alternative solutions for sustainable human resource development through the dissemination and effective use of Open and Distance Learning (ODL). Hosted by the Government of the Philippines on the campus of the University of the Philippines Los Baños, SEAMEO SEARCA is mandated to strengthen institutional capacities in agriculture and rural development in Southeast Asia to address poverty and food insecurity. It carries out its mandate through graduate education, short-term training, research, and knowledge exchange. Located in Melaka, Malaysia, SEAMEO Regional Centre for Special Education (SEAMEO SEN) specializes in providing educational development support for individuals with Visual Impairment, Hearing Impairment, Learning Difficulties and Gifted and Talented. The Centre aspires to contribute to the development of Special Education in the Southeast Asian region through comprehensive training, research and community awareness programmes. Hosted by the Government of Thailand, SEAMEO SPAFA cultivates awareness and appreciation of cultural heritage; promotes and enriches archaeological and cultural activities in the region; and furthers professional competence in the fields or archaeology and fine arts to advance mutual knowledge and understanding among SEAMEO Member Countries. 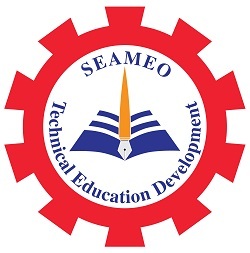 SEAMEO Regional Centre for Technical Education Development (SEAMEO TED) was established on 25 July 2017. The mission of SEAMEO TED is to assist SEAMEO Member Countries in identifying educational problems and finding alternative solutions for sustainable human resource development through technical education. 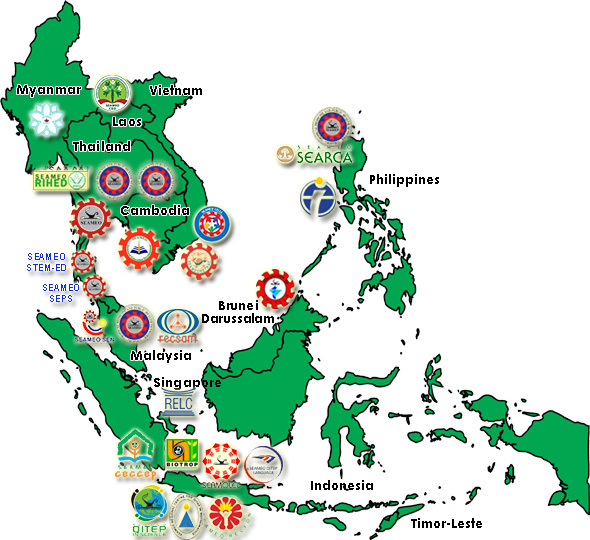 SEAMEO TROPMED Network has three regional centres in Malaysia, the Philippines and Thailand. The Network’s Central Office is hosted by the Thai government in Bangkok. Its overall role is to develop the capacity of individuals and institutions in delivering quality health care. The Central office coordinates the programmes and projects of the Regional Centres, executes regional projects and activities, and publishes the Southeast Asia Journal of Tropical Medicine and Public Health. SEAMEO TROPMED/Malaysia, located at the Institute for Medical Research in Kuala Lumpur, conducts research on the prevention and control of diseases and provides specialised training, diagnostic, consultative and advisory services. It promotes health management as a collective responsibility of government, private sector, non-government organisations, community and individuals. 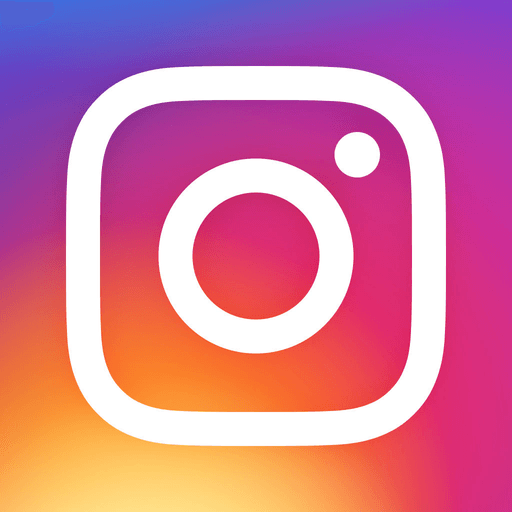 SEAMEO TROPMED/Philippines, based in the College of Public Health of the University of the Philippines Manila, conducts research and training in the fields of public health, hospital administration, environmental and occupational health. SEAMEO TROPMED/Thailand, hosted by the Faculty of Tropical Medicine, Mahidol University, Bangkok, offers training on endemic tropical diseases, parasitology, community and preventive medicine. It also conducts research on alternative control measures of diseases and the promotion of healthy lifestyles, including trails of new chemotherapeutic compounds and new vaccines. It provides clinical care to patients suffering from tropical diseases as well as academic services for laboratory diagnosis of tropical diseases and other special tests. SEAMEO VOCTECH improves the management of vocational and technical education and training (VTET) in SEAMEO Member Countries through capacity building programmes, research activities, partnership and consultancy services, and information sharing/dissemination services. The Centre develops and delivers relevant training programmes for VTET administrators/heads of institutions, implementers including teachers/ instructors and other relevant stakeholders through its regular programmes (free scholarship), in-country training, and customised, sub-regional training/special training programmes.